Welcome to The Takeout’s Unhealthy Salads Week, because America. Years ago I found myself in Central Ohio in the town of Waldo. I came here, a 45-minute drive north of Columbus, specifically to visit G&R Tavern, a restaurant that for half a century has made its name on its fried bologna sandwich. That’s another write-up for another day, because it’s a rather spectacular dish. But I’m here today to sing the praises of a dish I first encountered here (even though it’s long been a staple of Southern and Midwest kitchens). Ladies and gentlemen: ham salad. A salad in the same way tuna and chicken can be turned into a “salad,” but with chopped ham. I know, the combination “ham salad” feels like an unlawful contradiction. 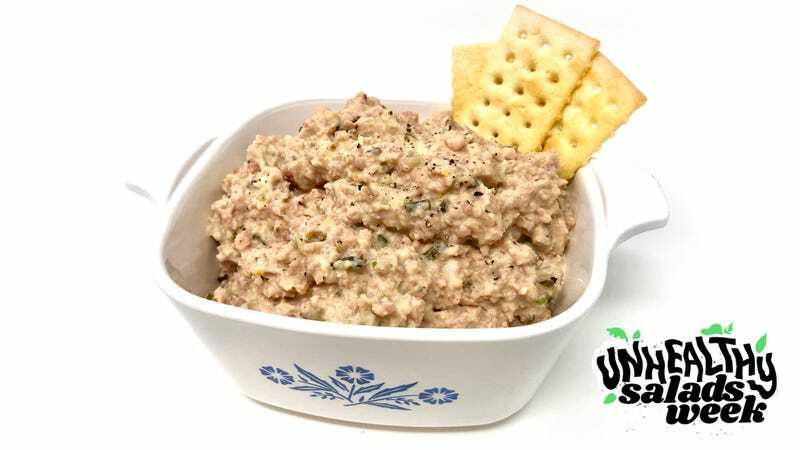 But see its potential: It’s working man’s pate, not too far from deviled ham spread. It’s delightful on crackers, even better between toasted bread and griddled. For those who feel a protein like ham would overpower with its hamminess, it doesn’t—the sweet pickle relish and mustard gives it a smooth, mellow savoriness. In the pantheon of unhealthy salads, ham is underrated and underappreciated. You can change that, though. Add cubed ham, celery, hard-boiled egg, shallots into a food processor. Pulse into a fine mince (you don’t want a paste-like consistency). Dump this into a large bowl, and add mayo, mustard, relish, hot sauce, Worcestershire sauce, and lots of cracked pepper. Combine until well-incorporated. I’ve purposely left out the salt, because your ham may be salty enough. Taste it. If it could use some salt, add a little at a time to taste. Chill for a few hours in the fridge. Serve with crackers as an appetizer, or between slices of white bread, then brushed with butter and griddled until golden brown.